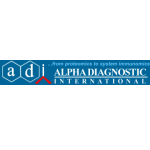 Alpha Diagnostic International (ADI) located in San Antonio, Texas, USA, is a major provider of custom services such as peptides synthesis and polyclonal antibodies. ADI specializes in the development, manufacture, and distribution of variety of ELISA reagents and kits for animal and human research. ADI maintains an USDA inspected and approved, animal facility. We have introduced a number of specialized anitbodies to a variety of new genes including obese/leptin, membrane receptors, and neurotransmitter transporters. We’ve redesigned and expanded our site to better serve the research and diagnostic community. We have convenient & secure online ordering system. This secure shopping cart makes it easy to order from more than 3000 antibodies, conjugates, Elisa kits, custom services, and other products and services for your research or diagnostic needs.